A good option for vegetarian guests. Preheat the oven to 200°C, gas mark 6. Cut the squash into 2-3cm chunks. Place in a roasting tin with the oil, onion, cumin seeds and seasoning. Toss to combine. Cook for 30 minutes, turning occasionally, until the squash is tender. Leave to cool. When cool, place in a food processor with any juices. Add all the remaining ingredients other than the flour, and blitz to make a rough paste. Season to taste. With dampened hands, shape a tablespoon of the mixture at a time into a ball, then flatten slightly. Dip into the flour. Place on a plate lined with baking parchment. Cover and freeze for about 30 minutes. Prepare and light the barbecue or preheat the grill to high. Cook the falafel on lightly oiled foil for 3-5 minutes, turning regularly until cooked through. 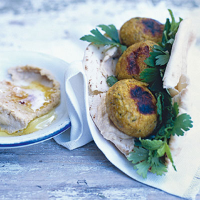 Serve in picnic pittas with salad and houmous.